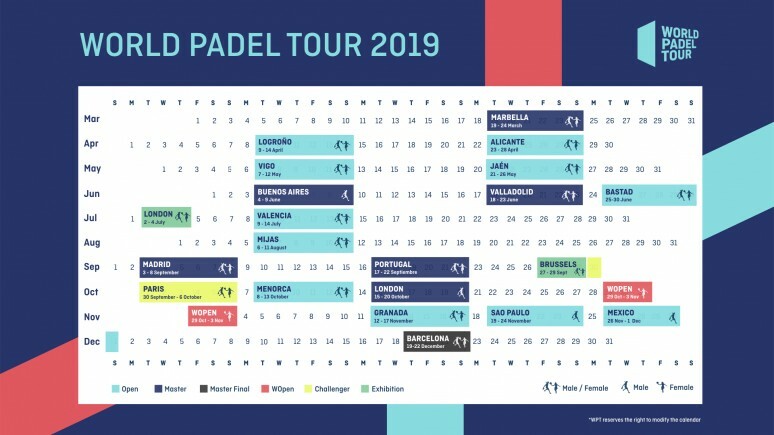 World Padel Tour already knows the path that the best padel in the world will have to travel in this incipient 2019 campaign. A season that starts with the label of being the most international in the history of the professional circuit. Mexico, England and Brazil will be for the first time host of a tournament in Open format in a calendar that will speak in 2019 more languages ​​than ever. With respect to the 2018 edition, unavoidable appointments are held as the Buenos Aires Padel Master, which moves its dates from November to June (June 4-9). The Swedish Open, repeats in Bastad and will accommodate this course to the female circuit. The first of these great novelties in the international venues will come in the form of Master, from October 15 to 20, World Padel Tour, will make history with the celebration of the London Master 2019. 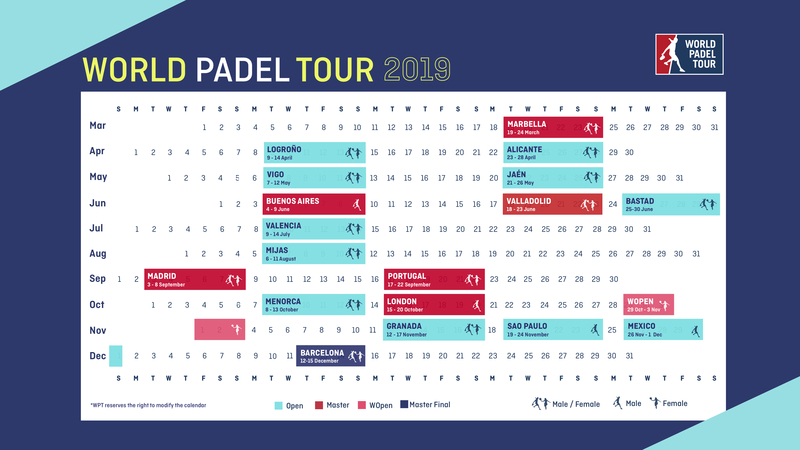 The final leg of the season will be a journey through unknown territory to the professional padel From November 19 to 24, shift to the Sao Paulo Open 2019 and almost without pause, Mexico City will take over with the celebration of the Mexico Open. There will also be news regarding the Spanish cities through which the World Padel Tour circuit will pass. Beginning with its inaugural stage in Marbella (from March 19 to 24) with the Marbella Master dispute. The second date of the course, also arrives with novelty, with the arrival of the circuit to La Rioja, with the dispute of 9 to 14 April, Logroño Open 2019. There will be a visit to Galicia of the best shovels on the planet. In this season, Vigo, will take the witness of Lugo as host of the Open in Galician lands (Vigo Open from 7 to 12). The last of the stages that will premiere in 2019, will take us to Menorca. From October 8 to 13, the Menorca Open 2019 will be held on the Balearic island. The end of the campaign will also come with novelty. The Estrella Damm Final Master will be held in Barcelona from December 12 to 15. A swap, which will give the capital of Spain the possibility of celebrating one of the 6 Master's in this new journey. Thus, the spanish capital will be the scene of Madrid Master 2019 from September 3 to 8.